Sikhs are a misunderstood religious group in the US. Sikh men—who traditionally sport beards and turbans—are sometimes mistaken for fundamentalist Muslim hellbent on America's distruction. Which, they are not. In the month after 9/11, over 300 hate crimes were committed against Sikhs according to the Sikh Coalition, a New York-based community group formed in response to that flurry of misguided reprisal attacks. The mass shooting at the Sikh temple in Oak Creek, Wisconsin, last year was another disturbing example of the cultural confusion that the 700-year-old South Asian religion causes for some Americans. Although Oak Creek authorities have yet to determine an official motive for the attack, the shooter’s white supremacist background and alleged claims of an “impending racial war,” left little doubt that he targeted the Sikh community because of their differing cultural heritage. Just last week, two incidents of mistaken xenophobia were reported: in Manhattan, a mob of 20 teenagers swarmed and beat a Columbia University’s Professor, Prabhjot Singh, supposedly because his turban and beard signaled to the marauding teens that he was a terrorist. Prof. Singh’s attackers allegedly yelled “Get Osama,” before they left Singh with a broken jaw and several missing teeth. In Mississippi, a judge ordered a Sikh defendant to “remove the rag on his head” or go to jail. The defendant had gotten arrested for carrying a short knife—or a kirpan—which, it turns out, is a religious requirement that some Sikh men follow. The kirpan is a ceremonial dagger that some Sikh men carry as a symbol of the martial history of the religion and the duty of manhood. Carrying the kirpan is one of the five articles of faith of Sikhism, as established in the 17th century by Guru Gobind Singh, the tenth leader of the religion. While advocates at the Sikh Coalition push for better education about their religion and non-violent, cross-cultural outreach as a means to stop the uptick in violence toward Sikhs in the US, at least one American Sikh sees the legacy of the kirpan as a reason to arm up as a more direct method of deterrence. Gursant Singh has a solution: he wants every Sikh man and woman to have access to and know how to use a firearm. He details it on his YouTube channel and writes about his disenfranchisement with other white Sikhs in his book, Confessions of an American Sikh. Gursant was born Clark Harris in 1956 to a proud military family in Southern California. 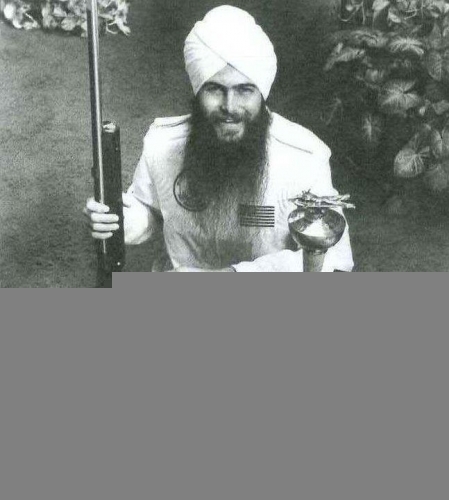 In 1981 he became one of thousands of white converts to Sikhism in American. He is a uniquely American mix of red-blooded gun boosterism and the heritage of a religion birthed half a world away. Get this: he sued the State of California because he claimed its ban on assualt assault weapons and high-capacity magazines interferes with the practice of his religion, claiming that the articles of faith detailing kirpan carrying extends to the bearing of large firearms. Gursant doesn’t speak for the majority of Sikhs in America. The kirpan is regarded by many Sikhs as a potent symbol of duty for Sikh men and part of the muscular tradition of Sikh warriors, but few Sikhs connect that tradition to gun ownership. We decided to talk with Gursant about his outlying beliefs that Sikhs should arm themselves, and how Sikhism might evolve in our pistol-popping, American context. VICE: What is the place for guns in Sikhism? It’s not the gun that is the thing to be afraid of. It’s the people who are using them. I think it’s important for our society to have the guns that these criminals have or that these hatemongers have. I feel a lot safer and I feel self-confidence that I can go where I want and I don’t have to fear about someone attacking me. Are you always strapped then? I just can’t imagine going out without wearing a handgun in today’s society. You’re just really asking for trouble especially in our situation where there are so many people out there who hate us for looking Sikh. It’s a personal defense weapon, and its legal to get one. You can defend yourself and your family without too much practice. Take a few classes and get the license. What are you currently packing? For 35 years I’ve always used a revolver. I was convinced recently the more modern thing is a semi-automatic .45 caliber handgun. It’s definitely more modern and effective. Revolvers are really good; they’re easy to shoot. You don’t have to worry about a safety because the hammer comes back. They convinced me at the gun shop these semi-automatic weapons are very safe now. Which was the major reason I didn’t get one before. The .45 caliber is a much larger bullet it has a lot more impact and will knock someone down, while the .38 revolver doesn’t have as much impact. With the revolver the cylinder has to turn when you pull the trigger so it’s not as accurate to shoot. The main thing is you want to be trained with the handgun you use, so in the right situation you can act quickly. These things happen very quickly. So you think that the attack on the Columbia professor could have been deterred? From what I saw he [Prabhjot Singh] wasn’t wearing a kirpan, and I think that would’ve been a real deterrent. It’s too bad. I don’t think Sikhs should be victims. I think there are enough teachings in Sikh history like by Guru Gobind Singh that we should be able to defend ourselves. And defend those who can’t defend themselves. That’s why, in my mind, we wear the kirpan so it’s not a showpiece. It’s supposed to be a way to defend yourself. It seems like the Sikh American community has a different idea. I think most of the Sikhs coming from India to the USA are interested in making money and aren’t as interested in upholding the Sikh principles as Guru Gobind Singh laid them down. You’ll see political advocacy groups like the Sikh Coalition, and they’ll never talk about firearms or self-defense. They’re more interested in pacifism. I think the stress on education is important, but education is not everything. It’s definitely not going to help you in a one on one confrontation where someone has an agenda. Try using education against someone like [Oak Creek Sikh Temple shooter] Michael Page. How has the community reacted to your YouTube channel or calls to start a Sikh shooting club? I have been kind of surprised by the lack of the interest. I was just talking to my wife about the lack of interest. There are so few Sikhs who would like to be, so-called orthodox Sikhs, or observant Sikhs about defending themselves. I do see that there are a lot of Sikh youth between the ages of 16 and 25 who are getting back to the fundamentals of Guru Gobind Singh and the proficiency with self-defense. I think there’s no substitute for guns. If you’ve got a mob or a bunch of people who want to attack you, a gun is a good equalizer. I think especially for women. I encourage women to learn how to use a firearm. And I think if all SIkhs had that weapon where they can legally have them, I don’t think people would mess around with them. They would never attack a Sikh if they knew he had a gun. That ‘s my opinion. You’re from a military family. Did you ever try to enlist? I tried to get in the army in 1982, but I was denied basically for being Sikh and wearing a Turban. This was even though I’m from an important family—my dad was in the Marines for 14 years. They’ve let three Sikhs in under an exemption they’ve been giving. I think they’re medical doctors. In 1948, President Truman had given an exemption for all Sikhs to join the army but in the 1980, the Moral Majority, they were a kind of right-wing Christian group, they had a lot of pressure on Ronald Reagan. So they changed that exemption. How did your White Christian parents react to your conversion to Sikhism? My father didn’t like it at first, and he kicked me out of the house basically. It took a few years to help him understand what Sikhs were about. He had to read a few books and see that it’s not a cult or something. But you’ve found a home in Yuba City? The first Punjabi Sikh farmers came here in the turn of the 20th century. The oldest Gurdwara (Sikh temple) in the entire country is here. So they’ve been Sikh farmers here for many, many generations. If you drive down Yuba City you’ll see Gurdwaras on the side of the road, there are many of them in Ffresno and Central Valley. My experience is that Sikhs are really good hardworking people. And they really have a good sense of values. I married a Punjabi lady about five years ago. And I’m really enjoying being in the family. But you haven’t gotten much of a response regarding gun ownership? I’ve talked to maybe six or seven people who have called me on the telephone. I invite anyone to call me on the issue. I’ve gotten likes on Facebooks and a lot of responses and views on You Tube. But in terms of people learning about firearms and incorporating it into their lifestyle it’s very few. Great article, on why Sikhs & all law abiding citizens for that matter, should carry handguns for self defense. I invite anyone interested to know more about self defense to Call or write Gursant Singh with questions and requests for help with individual or group training at your Gurdwaras on the use of hand guns and rifles for self-defense and security.